We’ve just ushered in 2017, and now it’s time for Chinese New Year! The date is based on the Chinese lunar calendar, which corresponds to a different date every year (in late January or February) of the Gregorian (western) calendar. This year, the Year of the Rooster, begins on January 28. In addition to Chinese New Year being the most important celebration for the 1.3 billion people in China (where it’s known as Spring Festival), Chinese communities in countries around the world will also be celebrating in the coming days. Celebrations traditionally start on New Year’s eve, with family members gathering for a “reunion dinner”, and continue until the Lantern Festival, on the 15th day. Food, of course, plays a big part in the celebrations, with particular foods having symbolic meanings such as luck or prosperity. The food eaten varies by country, and even regions within China. In a previous post, I’d mentioned that in northern China, families eat dumplings on Chinese New Year’s eve. In Malaysia, where my family is from, and Singapore, Yee Sang is a very popular dish during the New Year period, where diners enthusiastically take part in tossing a raw fish “salad” with their chopsticks. I’ve got a pineapple in my fridge and am still hoping to try my hand at making Pineapple Tarts for the first time this year. In the meantime, I was delighted with the success I had in making Kuih Bangkit! 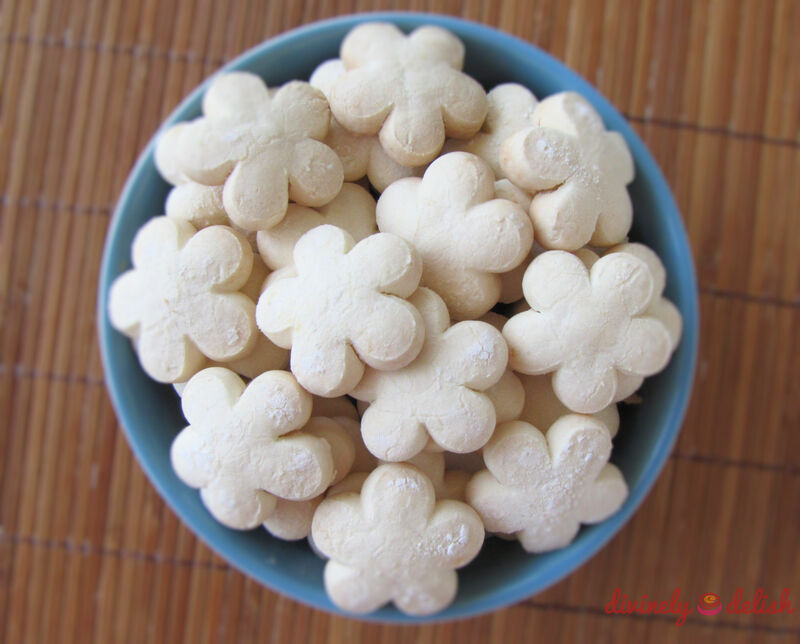 These tapioca cookies are popular in Malaysia not only during Chinese New Year, but all the festive occasions, including Hari Raya. I think the best way to describe the texture of Kuih Bangkit to those who aren’t familiar with these cookies would be a coconut-flavoured Asian version of my whipped shortbread cookies, but lighter, crispy, yet melt-in-your-mouth! Traditionally, wooden molds are used to make cookies in the shapes of flowers and animals. I was excited to use the new molds I’d bought, but I had a hard time with the dough sticking to the molds even though I floured them. Maybe I need more practice and/or patience! 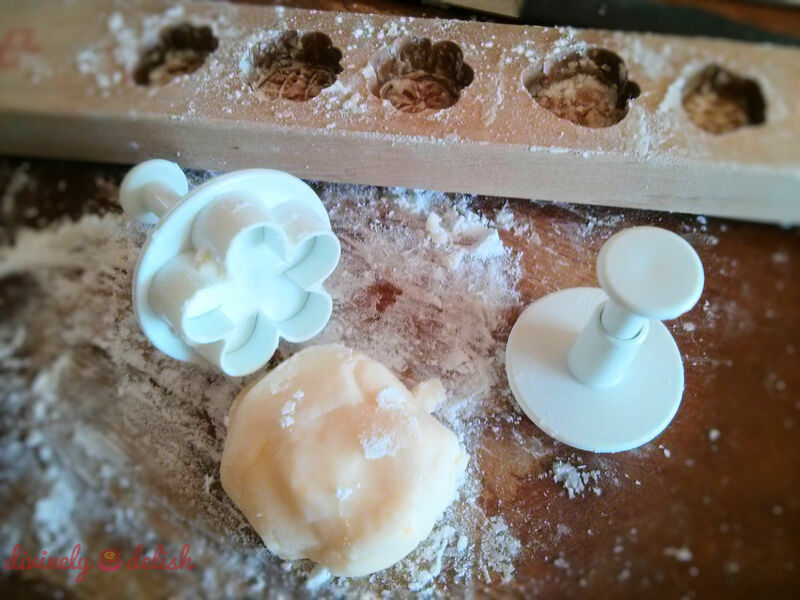 Fortunately, I found some fondant flower plunger cutters in my cake decorating kit and – voila! It worked wonderfully, and so much easier than using the wooden molds! Small (1″ or 1.5″) cookie cutters will also do the trick. Thanks to Linda of Malaysian Chinese Kitchen for this amazing recipe. It was spot-on! I’ve now made two batches of cookies using this recipe! Wishing all my Chinese readers a happy and prosperous New Year. Gong Xi Fa Cai! 1) Place tapioca flour in a baking tray. Cut pandan leaves into 3 inch lengths and bury them in the tapioca flour. Place in a 200°F (93°C) oven for 1 hour. Remove, pour tapioca flour into a bowl or another baking tray and allow to cool. 2) Once the flour has cooled, preheat oven to 325°F (163°C). 3) Sift cooked tapioca flour. You should get about 396g of cooked flour. Reserve 28g for dusting wooden molds/cookie cutters. 4) Do not shake coconut milk in can. Open and scoop out 180ml of the coconut cream from the top of the can. Set aside. 5) Cream egg yolks and sugar in a large bowl until light and fluffy. Add ⅓ of the cooked tapioca flour and ⅓ of the coconut cream. Mix with a spatula. Continue until all flour and coconut cream are used up. 6) Gently knead to form a soft dough. If dough appears to be too dry, add 1 to 2 additional tablespoons of coconut cream. Turn dough onto counter to knead if necessary. Dough should be soft but not sticky. Place dough back in the bowl and cover with a moist towel. 7) Place reserved cooked tapioca flour in a muslin/filter bag. Dust wooden mold or dip cookie cutter into the flour. 8) Pinch a little dough from the bowl and press into each of the wooden mold indentations. Trim off excess with a butter knife. Gently tap wooden mold on the counter to release molded cookies. Place on a parchment-lined baking tray. (Alternatively, if using a cookie or plunger cutter, on a lightly cooked-tapioca-floured surface, roll out some of the dough to ¼ inch thickness and cut into shapes). 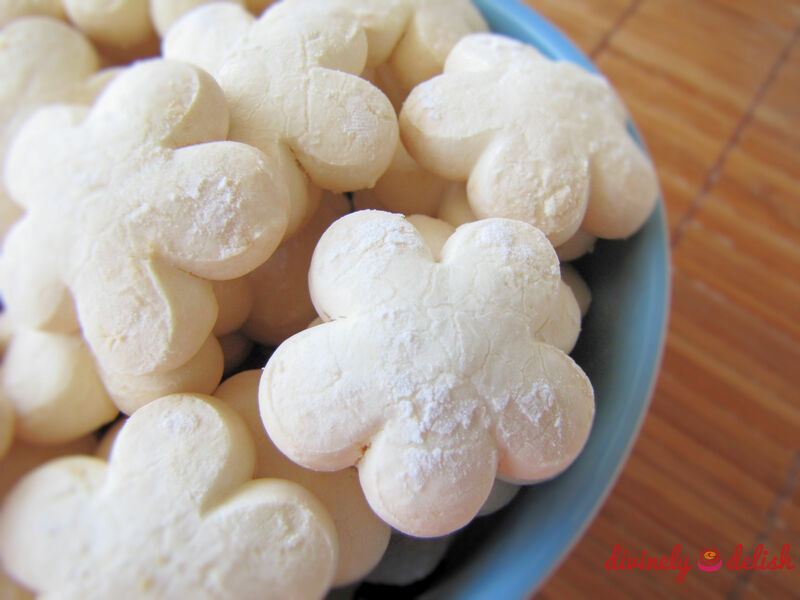 Make sure to dust the mold or dip cutter in the cooked tapioca flour before making/cutting out each cookie. 9) Bake cookies for about 20 minutes. The tops of the cookies should remain white in colour, but the bottoms should be lightly browned. Remove and allow cookies to cool completely. Note: I used a 1.5″ fondant flower plunger cutter. A 1″ cutter also works, for cute little cookies (these will require a slightly shorter baking time, maybe about 18 minutes in the oven). Cookies can be stored in an air-tight container for up to 1 month.